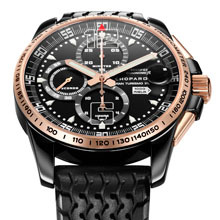 The embodiment of sporting sophistication and aesthetic elegance: Chopard has successfully melded two sometimes paradoxical features to endow the 1000 Miglia GT XL Chrono Speed Black with a unique strength of character. The association of rose gold and DLC blackened steel lends this model a distinctive dimension based on the power of contrasts. Chronometer-certified by the COSC (Swiss Official Chronometer Testing Institute), its chronograph movement will appeal to connoisseurs of fine mechanical engineering – whether expressed in watches or cars. 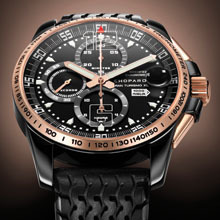 Contrasts and elegance: such are the immediate twin impressions exuded by the 1000 Miglia GT XL Chrono Speed Black. The gentle warmth of 18-carat rose gold on the bezel, pushers and crown makes a striking contrast with the sporting dynamics of the case in DLC (Diamond Like Carbon) blackened steel. Teamed with a black dial and the prominent natural black rubber strap with its 1960s Dunlop Racing tyre-tread motif, these effects confer an incredible sense of rugged reliability on the exceptional mechanical marvel. Water-resistant to a depth of 100 metres, the generous 44 mm-diameter case is in DLC blackened steel. This revolutionary process gives steel an exceptional resistance. Its hardness protects it from scratching and guarantees it will stand the test of time. In addition to the chronograph function with its central seconds hand, the minute counter at 12 o’clock and the hour counter at 6 o’clock, the self-winding movement chronometer-certified by the COSC also drives central hour and minute hands, small seconds at 9 o’clock and a date display through a window at 3 o’clock. The split-level counters along with the oversized 6 and 12 o’clock numerals transferred beneath the sapphire crystal create an impressive overall sense of depth and relief. The tachometric scale engraved on the bezel and the streamlined pushers further reinforce the sporting appearance of this horological “speed machine”, reserved for a privileged group of just 500 individuals.